I think this is what most people were looking for. Thanks for taking the time to get this done and great write-up. Just finished my 3.4L build, but if that ever goes you can be sure I will be going this route. Great write up!!! I cant wait to build the head I got from you!!! 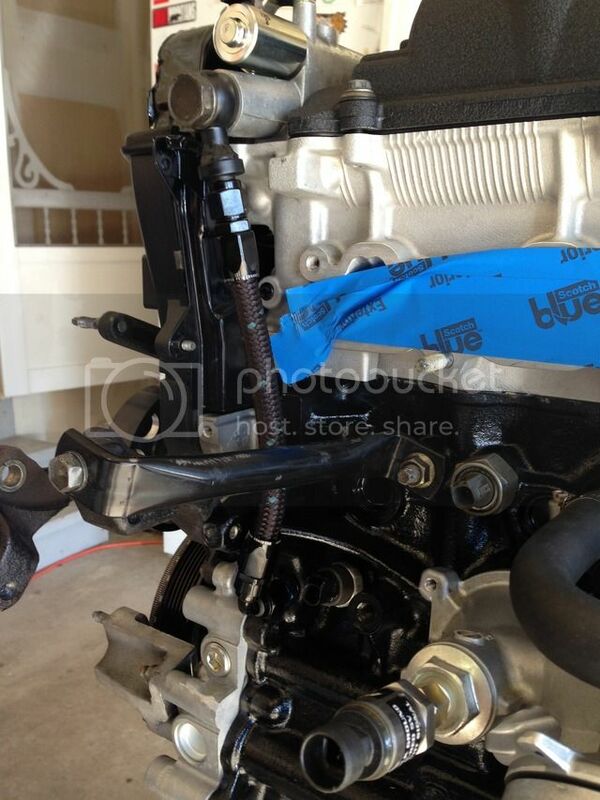 I will be retrofitting my early block and will be glad to take any pics if needed. Bob your block was a early one as well, no? Yes. I found a 1/8" bpt to -6AN fitting and its threaded in a machining hole next to the factory oil pressure sensor. Your correct ken it is post of the year, people need to understand vvti was ahead of its time. Own a NA 94, just overhauled the engine/tans, getting ready for the GTE swap, love the idea of VVTI- Less expensive than non VVTI, maybe i will invest in the VVTI GTE , less auto trans and spend the rest on an R154? will it devalue the car in the long run? or purchase a non VVTI with auto ? $1600 vs $2800 , ( im in los angeles having a auto is great, even thought it is a garage queen per say. Chris - Thread of the year! The first and possibly the second round is on me at SIV! What is the concern of going to high lift cams, +1mm valves, and the amount of intake cam adjustability now potentially causing valve-on-valve contact, or worse, valve-on-piston contact? Since these upgraded cams usually put our motors into an interference operation, don't you need to reduce the amount of retard/advance usable with vvti? Nice writeup. If I dont end up selling my car I might do this with a built engine and a 7x75. Yeah I notice the large oil pressure sensor hole and thought it might swap on without issues on my 98, guess its true. Very informative post, thank you for taking the time to share with us. Still curious about compression numbers. Good point, i think VVTI is awesome for mild modded single turbo, but going crazy with high lift cams will cause issues. With very thigh clearances, it will be very tricky to tune. what about a quick list of the useable management for VVTI? What are some of the ways people have adapted it to pre-97 blocks without machining? I use Kelford F cam 286°/282°- 11,2mm Lift and adjust up to 40° whitout any problems. Last edited by DentGuy; 06-02-2015 at 09:25 PM. Isnt that only on later blocks? Or am I confused. AEM V2 controls it as well so I assume Infinity would also. Last edited by Alabamaguy; 06-03-2015 at 11:01 AM. Also AEM V1 and V2. But they arent supported from AEM, so you'll have to figure out the settings yourself or buy a map from a tuner.